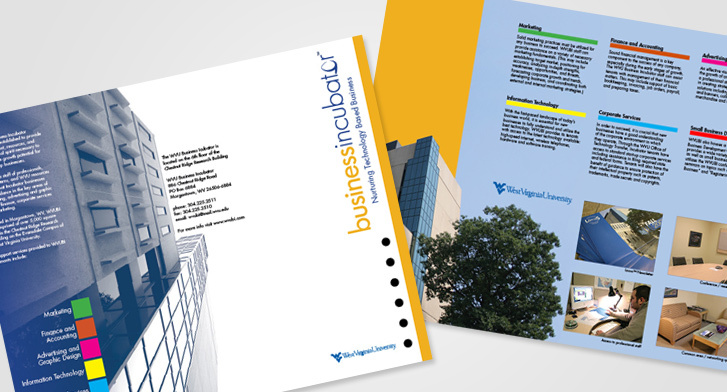 After creating a website for the West Virginia University Business Incubator (WVUBI) they needed something physical to take to meetings, trade shows, etc. so I went to work on a brochure. I worked with their General Manager to figure out the flow of the text that needed to be included and went to work. 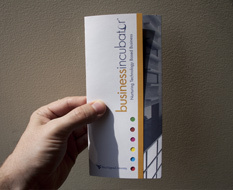 Knowing that the brochure would need to appeal to wide audience, I kept the design very simple, clean, and professional. Their are six “modules” of service the WVUBI offers, so I made this the main focus of the design. I gave each module a corresponding color and displayed them on the first page turn. 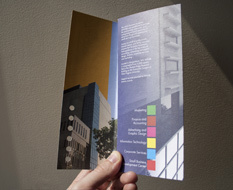 To incorporate these six colors on the cover, I designed the brochure to have six holes punched out that allow you to see the colors only. Once the page is turned the names of the modules are revealed and more details on each module are located in the next page turn. I also photographed several areas of interest at the WVUBI’s location as well as the building and incorporated them into the design.